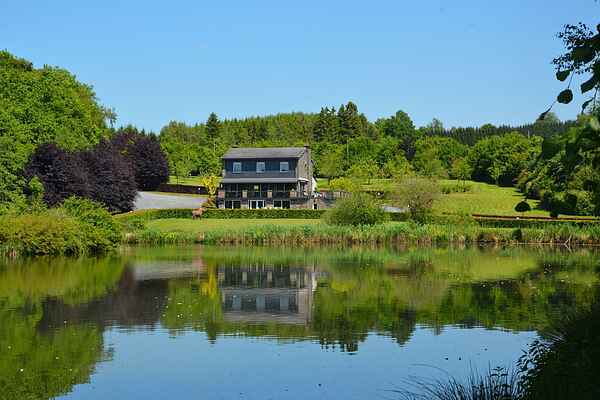 The Domaine du Vivier of Cresses, it is an ideal place to spend a delightful stay in the heart of the Ardennes. Quietly, enjoying the pools, the beauty of nature, you can spend delicious moments with family or friends. The cottage is very spacious with 5 bedrooms, its 3 bathrooms and a large living room with open fire. Large terraces, one covered, will accommodate your barbecues during the summer evenings and you can also have fun with the football. In the basement, there is also the possibility to rent separate meeting room for seminars (to be agreed with the owner). At your disposal, an additional garage for bicycles, umbrellas, cushions, boots, wet clothes ... with access to hot and cold water. With 7 hectares, its two large ponds and wooded paths, you find yourself in a beautiful park in the heart of nature. In Walloon, "Cresses" means "rock." Adjoining the Domaine du Vivier of Cresses, is a former quarry in which, in the past, the locals came to draw the authentic local stone to build their homes. Discover without waiting this unique place and experience unforgettable moments! The field has 2 boats and a paddle boat with 6 life jackets. Fishing is not permitted without user agreement through the owner to contact if necessary at the time of booking. All fishing is prohibited in the second pond under penalty of fine. You can also inquire catching crayfish with possibility to keep them for a meal. The owner provides the traps with caution. Failure to follow instructions for sorting garbage will be fined an amount will vary with hours worked for sorting (25 € / h).